I was rather hoping to see a “licio” or a “trio” in there somewhere, to bamboozle those spoilsports who don’t like us using these “English” words, but perhaps that was asking a bit much. I’ve renamed them on my phone to 18 and when the new ones arrive next week I’ll rename them to 19. No problem whatsoever. I really do, however, need to catch up. I think I’m only on #7. Wn i, sori. Dwi’n addo i wneud mwy, dwi’m licio dy siomi. Gad lonydd wnei di, dwi’n trio fy ngorau. Ti wastad yn gwthio! Did we get tears or not? This would be so much better with video. Tears and a slammed door. I’m just about keeping up, although I did study the wrong PDFs last night Ah well, I’ll class it as revision. A lot of the words don’t seem far off modern words though and as a learner I find it no harder to understand than some of the dialects in modern Welsh. I always wonder how accurate these are to the originals though - it would have originally been written in old Welsh, which is spelt quite differently and since this is obviously poetic, I wonder how they keep the original poetic structure, when they update the words inti middle Welsh. A little error here and there could change this poem entirely. 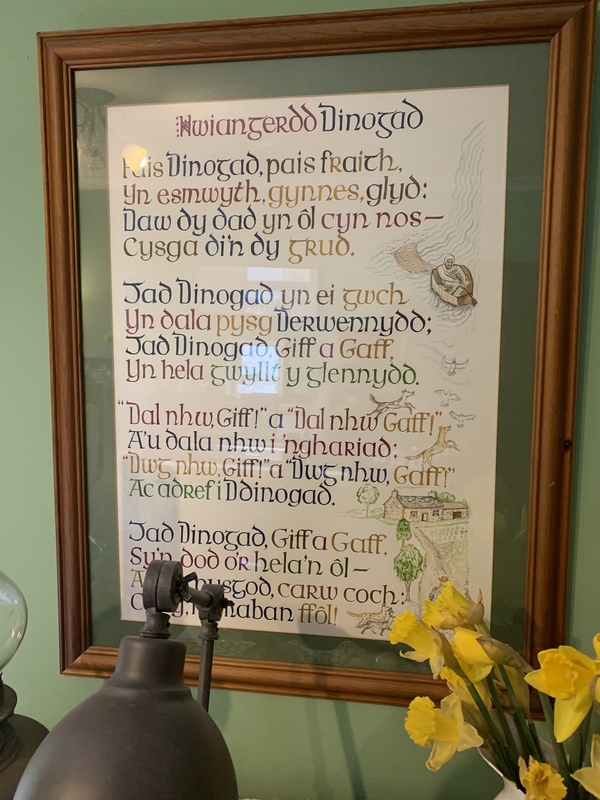 If Peis was Paith or e fraith, vraith was efras, fras (also spelt fraith or frais in old welsh) or balaot was baloedd or high peaks, chwit was chwith etc etc then the whole thing changes to a lament to a once luxurious hill fort call Dinogad (thinking like Dinorwig) and the dead warriors (colourful lions, that were slain like fish spread out in a coracle). The father goes hunting, and at the end of climbing here there and everywhere he sees the old place covered in bushes - llwyn… and is really gracious - go - grad… changing to gorad…(latin gratus). I trust the experts, who know their stuff, so not questioning the original, but just imagining how easily things could change over time, if the wrong person transcribed these over the years and just amazed at how things can survive this long without being corrupted, by something along the lines of Chinese Whispers. Here’s the lullaby on my wall. It was painted by Jonah Jones, who, coincidentally, is mentioned in the latest Advanced Content Sgwrs! Dinogad here is a baby, to whom the lullaby is sung. Sgwrs 19 (the previous one) was brilliant. Tricking us into thinking that it was going to be easy because Nan spoke so clearly, and yet she came out with so much “new” vocabulary. Exhausting and yet somehow rewarding. A bit like swimming a length at the baths (swimming pool to you young’ns) and ending at the deep end, happy to reach the grab rail. She certainly had a specific accent and dialect, but beautiful diction. You have a Llanrwst accent this week, and another clear speaker, so we’ll see how you do! Diolch Beca just had a listen and realised 11 minutes in I’d left the speed on x 1.4 ha. All this GOG is is working on me. I will try it again tomorrow on normal speed although I enjoyed the fast version. If your allowed faves last weeks southerner gets my vote and then the rownd a rownders but have found something in them all. Diolch eto. Diolch yn fawr iawn Beca. I really enjoyed the sgwrs with Nan. I’d recently been to Plas Glyn y Weddw (on the opening of Ruth Gibson’s exhibition) so it was extra interesting! I loved Jonah Jones’ work and your lullaby picture is beautiful. I envy Nan her purchase of one of Ruth’s pieces. Her work is stunning and well worth a visit to the gallery to see. Hoping to visit Manon’s shop soon too! Thanks, Beca. This latest one was great. Very interesting, clear and plenty of new specialised vocab. Also I liked the “Dio” . That’s “dydy o” (as in dydy o ddim yn), right?